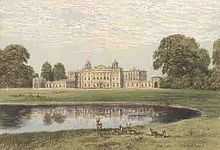 Badminton House in the 19th century. Badminton House is a large country house and Grade I Listed Building in Badminton, Gloucestershire, England, and has been the principal seat of the Dukes of Beaufort since the late 17th century, when the family moved from Raglan Castle, which had been ruined in the English Civil War. The house gives its name to the sport of badminton. In 1612 Edward Somerset, 4th Earl of Worcester, bought from Nicholas Boteler his manors of Great and Little Badminton, called 'Madmintune' [sic] in the Domesday Book while one century earlier the name 'Badimyncgtun' was recorded, held by that family since 1275. Edward Somerset's 3rd son Sir Thomas Somerset modernized the old house in the late 1620s, and built a new T-shaped gabled range. Evidence suggests he also built up on the present north and west fronts. The 3rd Duke of Beaufort adapted Sir Thomas Somerset's house by incorporating his several gabled ranges around the courtyard and extending the old house eastwards to provide a new set of domestic apartments. He raised a grand Jonesian centrepiece on the north front. The two-bay flanking elevations were five storeys high, and this was modified in 1713 when reduced to three storeys. Their domed crowning pavilions are by James Gibbs. For the fourth duke, who succeeded his brother in 1745, the architect William Kent renovated and extended the house in the Palladian style, but many earlier elements remain. The fourth duke was instrumental in bringing Canaletto to England: Canaletto's two views of Badminton remain in the house. Whether or not the sport of badminton was re-introduced from British India or was invented during the hard winter of 1863 by the children of the eighth duke in the Great Hall, where the featherweight shuttlecock would not mar the life-size portraits of horses by John Wootton, as the tradition of the house has it, it was popularised at the house, hence the sport's name. Queen Mary stayed at Badminton House for much of World War II. Her staff occupied most of the building, to the Duke and Duchess of Beaufort's inconvenience. Afterward, when the Duchess of Beaufort, who was Queen Mary's niece, was asked in which part of the great house the Queen had resided, she responded "She lived in all of it." In the later 20th century, Badminton House became best known for the annual Badminton Horse Trials held here since 1949. Badminton House has also been strongly associated with fox hunting. Successive Dukes of Beaufort have been masters of the Beaufort Hunt, which is probably one of the two most famous hunts in the United Kingdom alongside the Quorn Hunt. While fox hunts no longer take place at Badminton House, pheasant shoots continue to be held. Weddings and parties can be booked at Badminton House. Occasionally, houses and cottage on the estate can be rented. The estate was the location for some scenes of the films The Remains of the Day, 28 Days Later and Pearl Harbor. Adjacent to Badminton House is the parish church of St Michael and All Angels, built in 1785. It serves as the principal burial place of the Somerset family. Nearly all Dukes and Duchesses of Beaufort are interred here. The Ragged Castle, a folly on the Badminton estate. Set on a motte at the end of a main drive from Badminton House is the folly known as Ragged Castle, built c1750 by Thomas Wright of Durham and now a building at risk. It is a Grade II* Listed Building. ^ Historic England. "Details from listed building database (1320832)". National Heritage List for England. Retrieved 28 September 2015. ^ a b Harris, Badminton Guide Book. ^ Mills, A. D. (2003). A Dictionary of British Place-Names. Oxford University Press. ISBN 0-19-852758-6. ^ Hugh Montgomery-Mass, Christopher Simon Sykes, Great Houses of England & Wales 1994:219ff. ^ Montgomery-Mass and Sykes 1994:219. ^ "History of badminton". BBC News. 21 September 2005. ^ Montgomery-Mass and Sykes 1994:228. ^ "Ragged Castle". English Heritage. Archived from the original on 2011-08-26. ^ Historic England. "Details from listed building database (1156209)". National Heritage List for England. Retrieved 28 September 2015. Chisholm, Hugh, ed. (1911). "Badminton" . Encyclopædia Britannica. 3 (11th ed.). Cambridge University Press. p. 189. About half of this article is devoted to a discussion of Badminton House. This page was last edited on 13 November 2018, at 00:44 (UTC).